A big 24 hours of data is ahead of us, we have quite a bit to digest this morning as CONAB kicked things off early. Cotton markets are moving this morning as March cotton is up 1.17 cents, pushing at one point above 81 cents. This market is showing no signs of slowing down. Over at the CBOT things are slow as usual with corn unchanged below 350, soybeans are UNCH at yesterday’s close of 955 and wheat is down a couple of pennies as March and July KC wheat futures run into resistance levels near 440 and 470. CONAB numbers were just released, they pegged new crop Brazil soybeans up 1.2 MMT from the prior report to 110.4 MMT. The USDA is estimating the Brazilian crop at 108 right now. A year ago, soybean production nearly topped 115 MMT, so production will be lower this year without further increases. Brazilian corn production came in at 92.3 MMT, almost unchanged from last month. 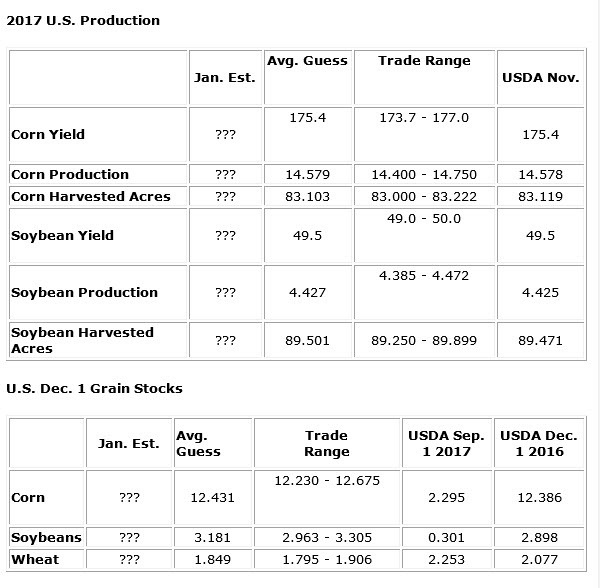 The USDA is at 95 MMT right now, both of these estimates are well down from the 98 MMT a year ago as planted acreage is off about 5%. The market is taking these numbers in stride right now. 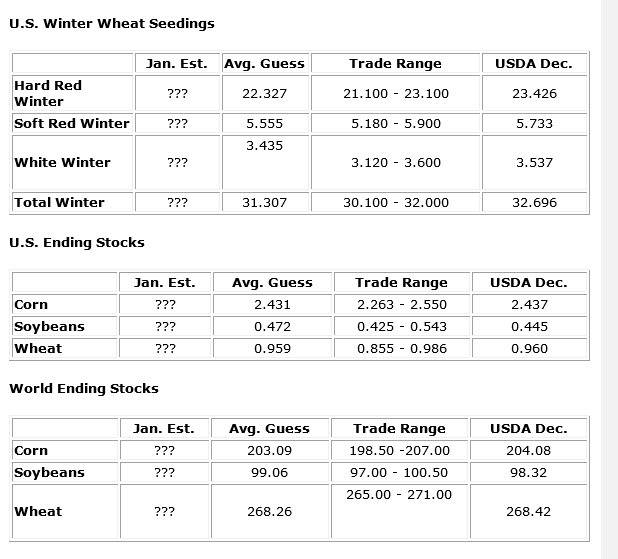 USDA export numbers came out and were pathetic for wheat. We saw net sales of 71 K for this marketing year which was down from last week’s pathetic number. I guess you could blame the holiday, but this has me shaking my head. Corn exports came in 437 k, up from last weeks down trade but down about 50% from the 4 weeks prior. Soybean sales came in near 607 K which is up substantially week over week but very poor compared to the last 4 weeks prior. Meanwhile, cotton exports came on fire again near 300 K bales. This will support any idea of future export hikes from the USDA beyond tomorrow. Bottom line, the CBOT export markets need whatever advertising the cotton guys are using. The fire that is the cotton market continues this morning in the old crop contracts. We have hit a point in the rally where the December 18 contracts are being left behind as they are red this morning, hanging just below 75 cents. This tells me the market is entering its final period of the rally, how long we go would be a guess. I think it could potentially rally all the way through March delivery. The May cotton entered a buy seasonal on the close yesterday, we are off to a heck of a start so far for folks who took that recommendation. Things are lining up for a spike top at some point, looking out at the weekly charts it is difficult to think we can get above last spring’s high near 87 cents (we saw 85+ for all of 1 hour). The market is moving into an inversion in the March-May-July for the first time in a while, this is the market attempting to ration supply as it encourages buyers to wait for the May time period. July 18 vs Dec 18 cotton is trading at its recent high near 5.25 cents, which is just around the high we saw a year ago at the end of January before correcting. The July-Dec 17 spread reached 12 cents in May of 2017 before falling apart. Trading these markets as a hedger is really not that difficult with options. Just pick ratios you wish to roll your hedges up and let the math do the work. If you are in a 77 cent hedge, you can roll up to the 80 cent strike for 1 penny. Aggressive hedgers may want to try for that, but if you are more conservative try for a 4:1 where you roll the 77 up to 81 cents for 1 cent. Regardless, keep your head about you, run away markets like this do end as we saw in the May time period a year ago. Check out the spread charts from a year ago in the 17 July Dec spread vs this years version (via futures source). It will be very interesting to see how much more spec funds can add to an already record long position here. Tomorrow’s WASDE report for cotton is expected to show a slightly lower US production number and higher exports by about 300 K bales from last month. The ending stocks estimate comes in near 5.5 million bales, down from 5.8 million bales but well up from the 2017 carryout of 2.75 million bales. A year ago we were seeing the ending stock estimates in the 4 million bale range, so we are assuming almost 1.5 million more at this time. The market is telling us those guesses are too high. The report does not touch on the quality of any of this supply, which is probably the most important factor driving prices right now besides India. Regardless, we are not cotton deficit right now. The board is record long and the parabolic nature could break at any time, tomorrow offers ample opportunity. Roll those hedges up if you see yourself selling product before the Feb delivery starts, if you think it will still be a while, roll hedges out to May before the March takes off at an inversion against May, making it more expensive. I expect the wheat markets to stay below resistance until we get the seeding numbers tomorrow. Early estimates would be for a 32 million acre winter wheat crop, down from a year ago making this the second smallest crop from an acreage standpoint in US history. Australia released its wheat numbers and ending stocks there have fallen to the lowest levels in more than a decade. That will help PNW producers through strong basis as Asian buyers come here. Meanwhile in Russia, freezing temps will be widespread, and lows in the single digits being observed. Its way too early to worry about any crop yield loss there, but it is something to monitor. Right now US HRW is more expensive at the ports than what is coming from the EU or the Black Sea, that may keep a lid on July futures at 470 for now. Given the export numbers, I would exit long positions.